Bouldering is an urban trend that is equal parts athletic adventure and social connection. Climbing to new heights has taken on a different meaning in Canadian cities. In 2015 the Canadian climbing gym market grew by a significant 15%, bringing our number of commercial climbing spaces to 69 according to Climbing Business Journal’s trend report. However, it’s indoor bouldering, a ropeless spinoff of traditional climbing, that’s proving most popular. Whether it’s an after work activity for a bit of exercise or a novel Saturday night hangout, finding a way to incorporate this new craze into your life shouldn’t be hard. Bouldering is different because it doesn’t require ropes or a harness. Instead, climbers rely solely on their bodies to make their way up and across the climbing wall by maneuvering from stone to stone. Don’t worry, you don’t climb high and there’s always a cushy mat on the floor to break your fall. I recently tried my hand at the sport at Seven Bays Bouldering climbing gym located in Halifax, NS and loved it. As a first time experience it was physically challenging to try to stay on the wall, but it became easier as time went on. My mind was challenged just as hard as my body, given that the climbing routes require some logical thinking skills to make it step to step. Ogasawara has been active in the sport since being introduced to it while visiting New Zealand. 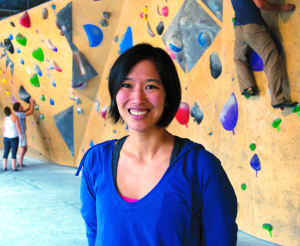 Her original plan was to open a gym, which blossomed into a climbing facility complete with a conjoint café. She wanted to create a hub for the climbing community, but it’s become so much more. In its nearly two years of existence, the space has become quite the urban community hangout, marrying an athletic pastime with a casual laid-back space. Climbing gyms are vying to become the “third place” of their patrons—hoping to be the spot, other than work and home, where people will spend their free time. Given the lighthearted vibe of the space, Ogasawara says it’s a sporty environment that attracts both women and men of all skill levels. Without the pressure of being scrutinized, bouldering gyms are a great place to have fun and reap the benefits of the sport. Ogasawara mentions that even though it’s not an intense cardio workout, it can help to strengthen your shoulders, fingers, forearms and core. And what a time to get involved: Ogasawara says that in the last four to five years she’s seen the amount of climbing gyms explode. 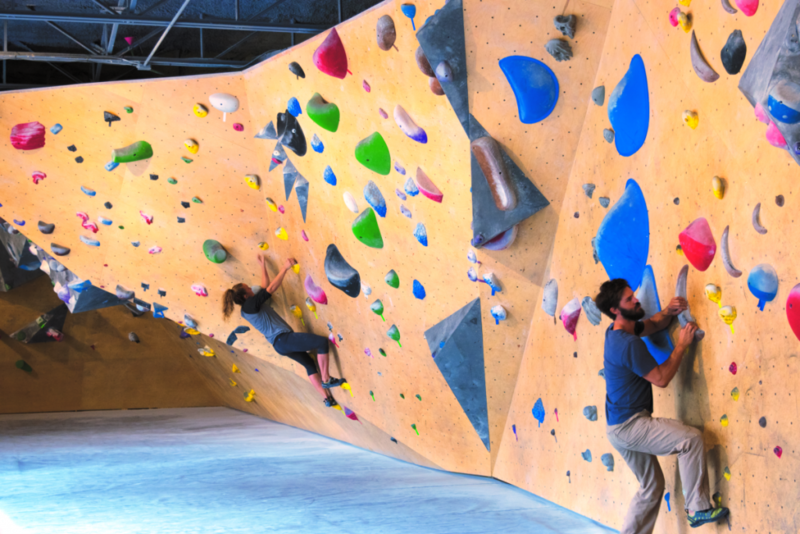 The hip-factor has been raised to a new level thanks to trendy gyms like Brooklyn Boulders in New York City. If that weren’t enough, bouldering will be included in the 2020 Olympics in Tokyo, which means it’s here to stay. Here in Canada, British Columbia has been graced with the most indoor climbing gyms, but provinces like Québec and Alberta are getting in on the climbing culture as well and feeding the demand. If Canada’s 2015 rise in climbing gyms is any indication of what’s to come, then we’re all about to chalk up and give bouldering a try. “It’s an amazing sport for people who aren’t necessarily into going to the gym and a lot of people appreciate the social value of bouldering as well,” Ogasawara says.